Thanks for all the great comments and of course the great scores. Now the bad news... the photo was staged. It is a real hawk. To make things worse I bought that window at an antique store the same day. The setup was outdoors on a picnic table. My mom held the frame with her hand. My sister held a monolight on the left side, creating the reflection on the glass. That seemed to give it a nice afternoon look. I noticed the reflection of a white fence and a white pole in the window, but I felt it could be something inside of the house so I left it alone. 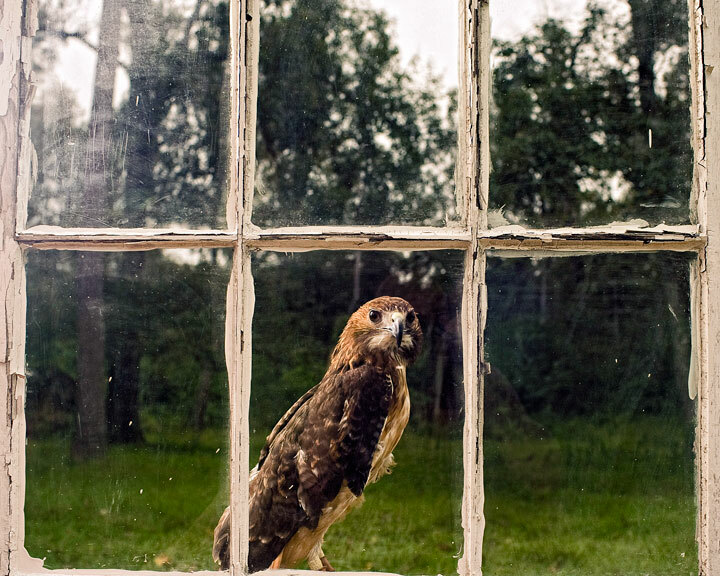 I felt bad so many people seemed attracted to the photo because they thought a wild hawk just landed on my window. Sorry for the deception guys. Scarlet, the Red-tailed Hawk, is missing part of her left wing. Here is another photo of her. She is taken care of at Wings of Hope and used for education. Wings of Hope is a nonprofit animal rehabilitation organization. They take in injured or orphaned animals from the area and try to nurse them back to health. Those that can be released are set free. Those that can't be released are taken care of. My family has been volunteering with Wings of Hope for almost a year, and I've taken photos of the animals and updated their website to support them as well. Please take the time to read a little more about Wings of Hope, and if you feel you can, make a small donation or purchase something from their store. The profits go to support Wings of Hope. Great photo and loved your story to go with it! Congratulations Brian! No apology necessary. "Staged" is part of artistic expression, IMO. Nice work. Congrats on your HM, well done! Message edited by author 2009-10-19 00:29:07. I don't feel at all deceived. CONGRATS! Well done! I was hoping to see this on the front page..Well done, congrats on 4th! First of all, spectacular catch! I would have cropped off the left side since the reflection so bright and also cropped a chunk off the top since it draws the eye. (ok, so 2/3 of the way into the left panes and down 2/3 of the top panes.) It would move him a little off center and bring out the nice glowing colors since it's not up against the overblown highlights. depth of field is good, i hope that is a real bird, because this is an awesome photo. nice use of the frame as well. What a fortunate capture. With the lighting and the way it is just sitting there, it's almost like you've trained the hawk to do this lol. Beautiful shot. Great timing for this challenge. Nicely done! WOW, I guess so, I've only seen one time a hawk by my window, this is fab, I love it, 10. How cool is that? Lovely shot. Hell of an afternoon visitor! Great catch and amazing clarity through the glass. Proudly hosted by Sargasso Networks. Current Server Time: 04/25/2019 08:37:11 AM EDT.